Secretary-General António Guterres took office in January 2017 amid unprecedented global calls for female—and feminist—leadership of the United Nations. With the signal that the incoming Secretary-General would be open to advancing a feminist agenda as part of his leadership platform, the Feminist U.N. Campaign was born. The Campaign – composed of women’s rights organizations, advocates from civil society and U.N. staff – released a set of targeted recommendations for a 100-day agenda the new Secretary-General could advance to promote needed, feminist transformation throughout the U.N. System. At the end of that period, it published a report card assessing Mr. Guterres’s progress against those recommendations and pledging to, as the Secretary-General had invited, “hold his feet to the fire” in ensuring strong actions followed early promises for change. 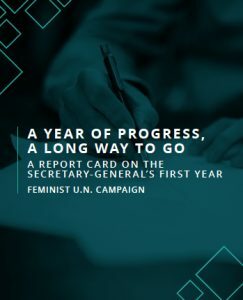 At the end of Mr. Guterres’s first year in office, the Feminist U.N. Campaign has again conducted a rigorous progress assessment, capturing feedback from academics, feminist civil society as well as U.N. staff and watchers around the world. Our report card measures progress against a feminist vision for change. We should note that this assessment grades the Secretary-General’s progress against the Campaign’s recommended agenda, not his own, and is therefore independent and admittedly ambitious.